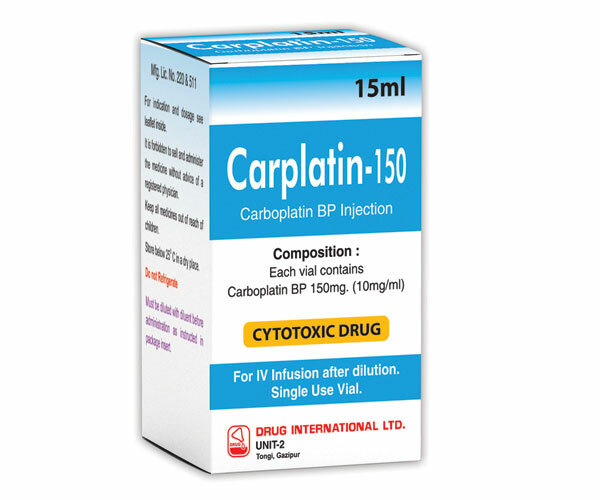 Carplatin150 Injection: Each vial contains 15 ml solution of Carboplatin BP 150 mg (10 mg/ mI). 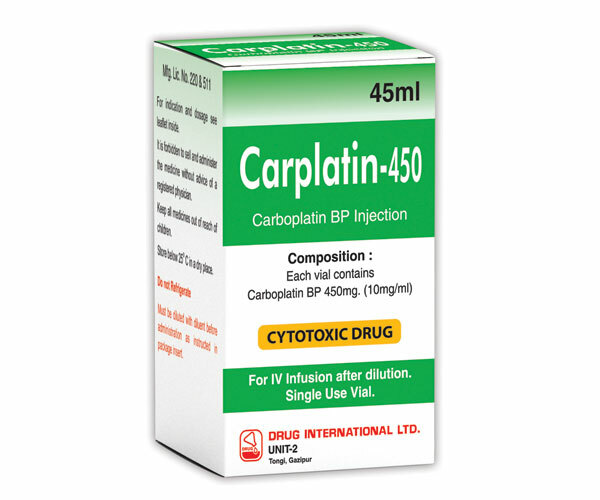 Carplatin 450 Injection: Each vial contains 45 ml solution of Carboplatin BP 450 mg (10 mg/ mI). Indication : Carboplatin Injection is indicated for the initial treatment of advanced ovarian carcinoma of epithelial origin in established combination with other approved chemotherapeutic agents. It is also indicated for the palliative treatment of patient with ovarian carcinoma recurrent after prior chemo therapy. Dosage and administration : Notes Needles or intravenous sets containing aluminum parts that may come in contact with Carplatin injection should not be used for the preparation or administration. Aluminum reacts with Carplatin causing precipitate formation and/or loss of potency. Procedures for proper handling and disposal of anti-cancer drugs should be implemented. Several guidelines on this subject have been published. There is no general agreement that all of the procedures recommended in the guidelines are necessary or appropriate. Please see prescribing description for more information. Use in pregnancy and lactation : Pregnancy Category D. There are no adequate and well controlled studies in pregnant women. Carplatin has been reported to be found in human milk. It is not known whether Carboplatin is excreted in human.